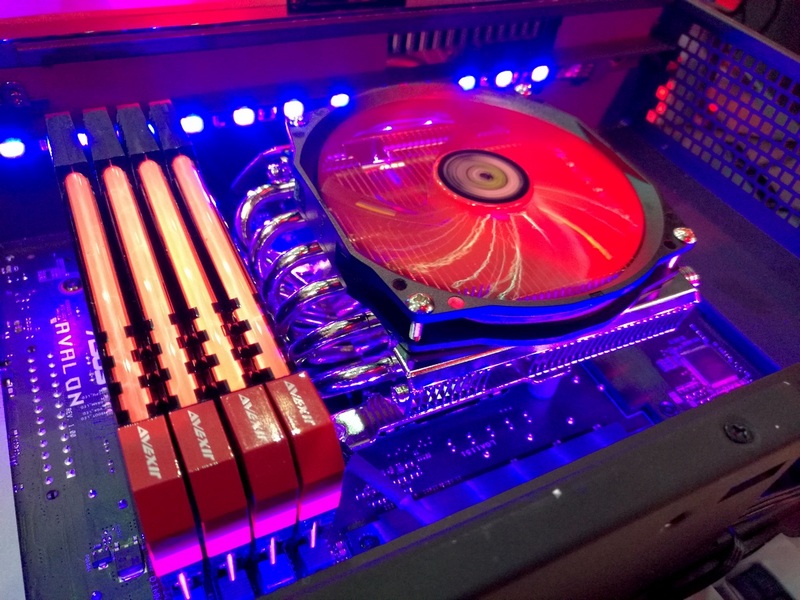 When you’ve been reviewing and testing motherboards, as well as shouting at certain engineers for absolutely nonsense ideas (or really good ones), there is somewhat a monotony to it all. One generation there’s a new feature from one manufacturer, and the next generation we see it on mostly all the others. Some features are special and aren’t copied, but these require larger amounts of R&D and investment, then require the PR teams to communicate why the new feature is good or not. One interesting conversation I had a couple of years ago was regarding the future of motherboard form factors. It was then as we see now: the full sized ATX, micro-ATX and mini-ITX systems accounted for 99%+ of desktop class PCs. Some large OEMs had their own designs on desktops, Zotac has a number of small mini-PCs for various markets, and servers do all sorts of standard and non-standard sizes, but for consumer, it is essentially all about those three (and mini-STX is now moving in to that space). So a couple of years ago, when the initial talk of Steam machines was coming in to play, ASUS asked me what I thought about non-standard motherboard sizes in desktop sized systems. It should be clear to most that the motherboard size issue is a chicken/egg situation. When Intel designs a CPU, there are certain limitations to where everything should go. Or no, I will correct that – there’s a budget limitation to where things can go. For example, memory is often to a certain side of the CPU because that provides the best quality signal for the onboard traces. Technically it can go on a different side (as it does on some designs), but that often requires more motherboard PCB layers to ensure the signal does not degrade or interfere with other signals, and in most cases there is a performance/latency penalty if you have to put it further away. But in order to stay buoyant, a motherboard manufacturer will stick to the appropriate design, because guess what – all the cases use the same standards too. The minute you produce a novel motherboard design, such as a different IO position or a new method for storage, none of the current cases on the market will work with it. So the case manufacturers can’t change because there are no products in a new design, the motherboard manufacturers can’t change because of the lack of cases but also the cost, and Intel keeps it consistent to keep everyone in the chain happy. Hello chicken, meet egg. Hello egg, meet chicken. The only way to do a custom form factor is to build the system completely yourself, which is what Zotac does. Zotac plays mainly in the mini-PC market, and their owner Partner (‘Manufacturer of motherboards, AGP cards and other consumer electronics’ on their Google Search) has long fingers into manufacturing for other big name brands, so integrating the Zotac brand into new designs with custom chassis is easy enough. However ASUS wanted to go bigger and better, and that is how systems like the G20, a full desktop with a custom design, and the GR8, a book-sized Steam machine, came about. But it was clear, ASUS wanted more. Insert Project Avalon. 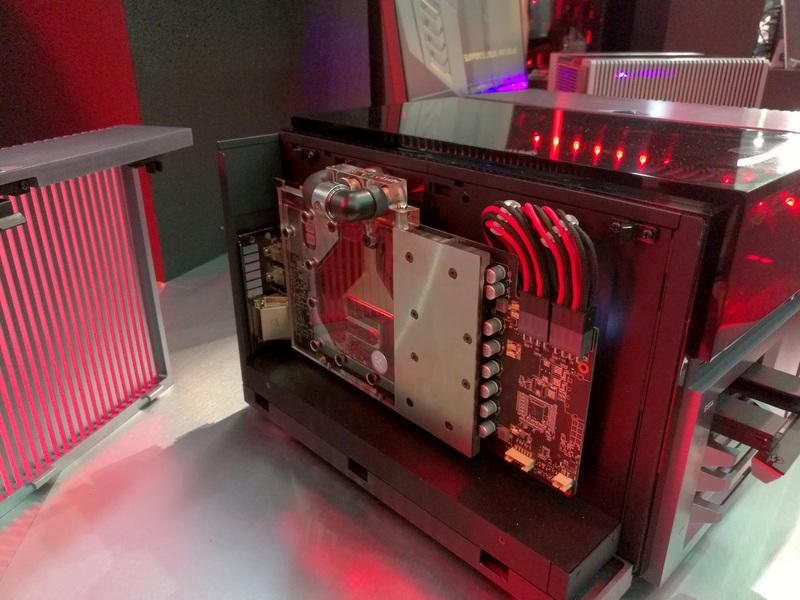 Project Avalon is a custom, high-performance, gaming/VR PC design from ASUS. It is still very early in the design cycle, to the extent that this chassis currently weighs almost 40 lbs, but the concept is there. Inside is a custom designed motherboard that uses various internal connectors to implement various features. 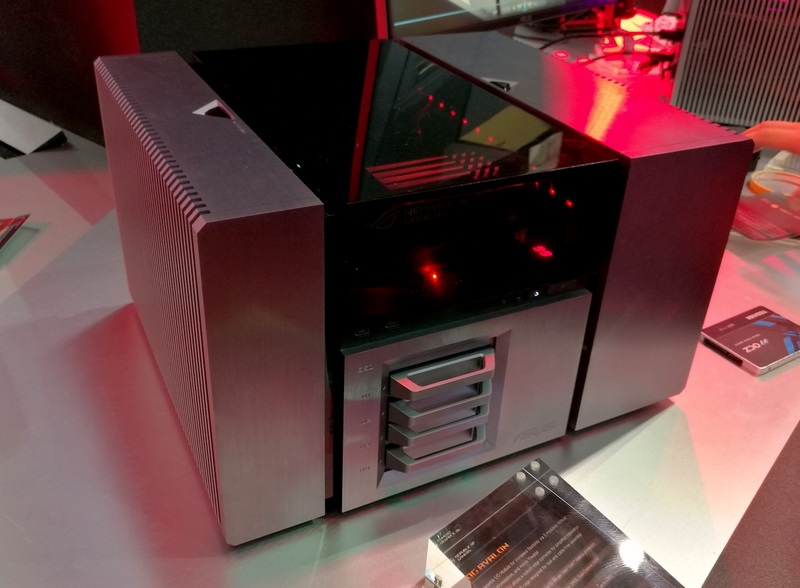 The design as it stands is built for Skylake plus a single GPU, and enough space to operate liquid cooling. The Perspex window on the top is so users can see in to the design, flashing lights and all. 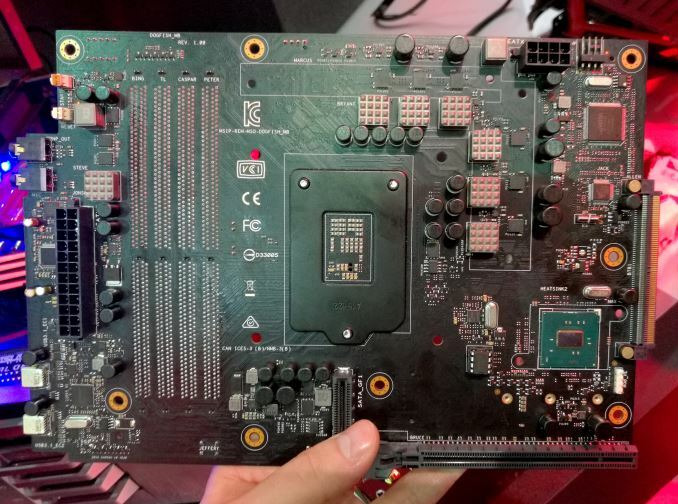 Here we see more of what we know – power delivery chokes, a chipset, an 8-pin CPU power connector, a PCIe x16 connector and a 24-pin power connector. There are no SATA ports, and nothing on this system looks normal. So, to explain: on the bottom near my finger is a custom connector, akin to a 4x PCIe connector, that breaks out into four SATA ports on a daughter board where are hot swappable on the chassis. The connector supplies both data and power. On the far right is a proprietary ASUS header for the rear IO. 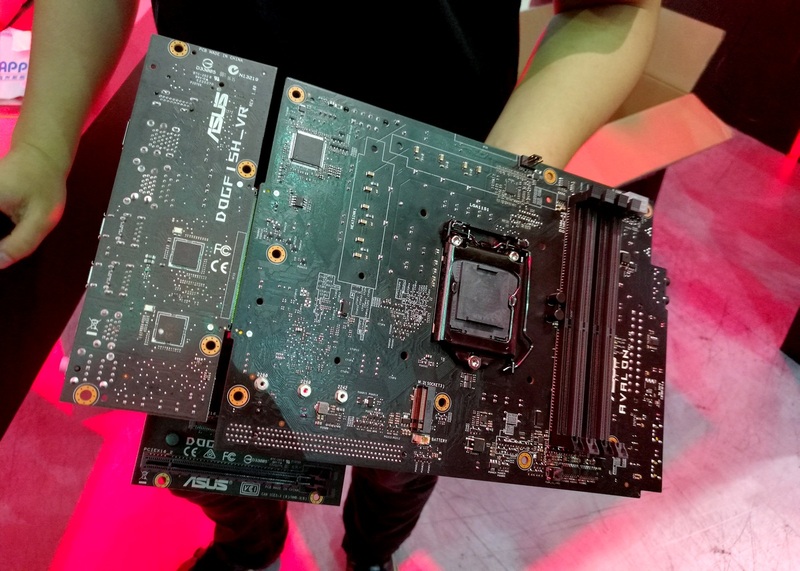 At current, ASUS is not finalized on the pin layout and isn’t conforming to any particular standard, but this connector can send chipset PCIe lanes, digital video, and a few other things, over to a daughter board. This means one thing – adjustable rear IO panels! I love this idea. Here are two examples of what ASUS suggests: the top one is a rear IO for workstation users, featuring dual Intel NIC and inside is a RAID capable M.2 slot running at PCIe 3.0 x4. The rear panel is a Home Theater focused design, using a single NIC and a USB 3.1 controller for 10 Gbps use. 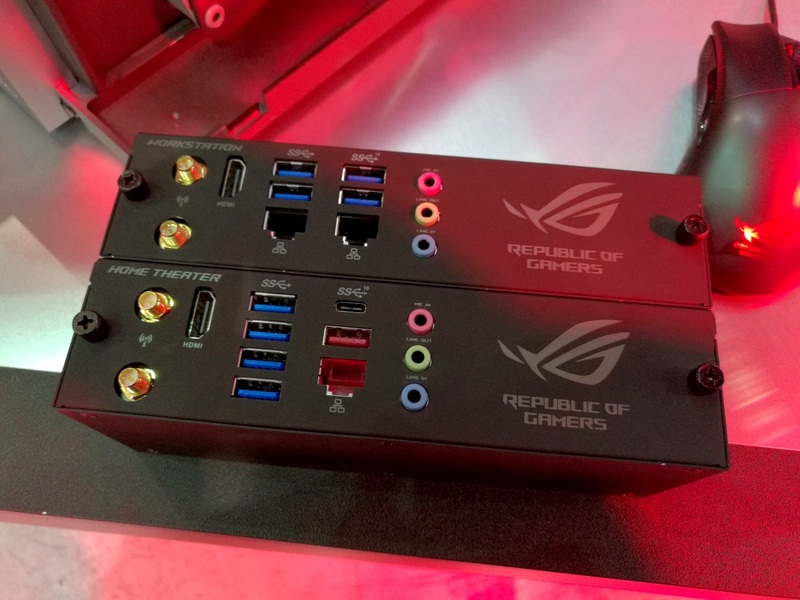 ASUS also had a VR edition with the specific ports required for the big VR headsets currently in the market. Because the custom connector carries enough PCIe, this opens it up to other custom designs, such as Thunderbolt, 10 Gbit Ethernet, different Ethernet/WiFi, additional storage, or anything that needs PCIe. Also, on the audio side, because this is a separate board, it could also influence audio capabilities and provide cleaner signals for audio processing. Adjustable rear IO is a topic only just being breached, with plenty of possibility. At this point the Avalon project is in an early design phase, so ASUS is looking for feedback with what they have so far. I don’t particularly mind if this ends up being an engineering concept design that never goes on sale (I’ve been pushing manufacturers to do more concept designs, similar to vehicle manufacturers at car shows), but the fact that ASUS are prepared to even attempt this is a good thing. End users who are buying Broadwell-E are almost always doing it for 3+ way SLI reasons, which pretty much forces you into full ATX. Correct until GTX 1070&1080 were introduced. Starting with the GeForce GTX 1080, Nvidia is discontinuing official support for 3-way and 4-way multi-GPU SLI setups. "So I don't understand why manufacturers don't want my money?" "The three major form factors for custom build personal computers, in order of popularity, are ATX, followed by micro-ATX and then mini-ITX."